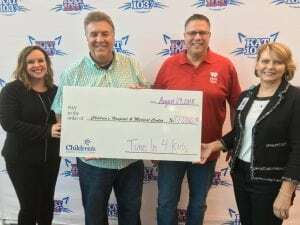 Thanks to the support of KAT 103.7 listeners, WOWT 6 News viewers and the entire community, the Tune In 4 Kids radiothon raised an incredible $277,000 for Children’s Hospital & Medical Center Aug. 23 and 24, 2018! All of the money donated locally stays in our community to support important programs, life-saving equipment and vital research to help Children’s meet kids’ unique healthcare needs. We are tremendously grateful to the many patient families who shared their heartfelt stories and to everyone who so generously donated during this event. Thank you!